Washington, D.C. – On Earth Day, U.S. Representative Patrick E. Murphy (FL-18) joined U.S. Secretary of the Interior Sally Jewell, Florida Department of Transportation District Secretary Gus Pego, Assistant Secretary of the Army for Civil Works Jo-Ellen Darcy, National Park Service (NPS) Deputy Director Peggy O’Dell, and other federal, state and conservation partners to celebrate continued progress on Everglades restoration projects at a ceremony that took place at 2:00 p.m. at the Long Pine Key Campground Amphitheater in Everglades National Park. 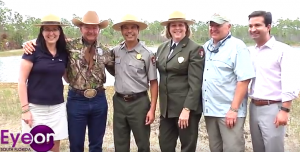 This event kicked-off the celebration of the next phase of the Tamiami Trail project that is critical to restoring the Everglades’ natural flow south. Rep Patrick Murphy spoke with us following the ceremony to discuss today’s request to the White House for emergency assistance for Florida’s water crisis.